Space Junkies comic book series and related entertainment activities by S.K. Arunachalam are set to invade Earth stores and other venues where intergalactic adventures are sold. The saga begins as a rag-tag band of space pirates led by Captain Ggreed, along with Navigation Officer Puig the Ragin' Pig, Communication Officer Margo, Science Officer Jisp, Tech Expert Preston, three Slugs intoxicated on MOJO, and others, stumble upon a rare and extremely valuable source of fuel known on the black market as Cheesecake. Problems escalate as the Space Junkies find themselves jetting around in their Junk Jumper ship to such exotic locations as Planet Blue Cheesecake, Terra 2.0 and space station Yellow4z901 in a battle against forces bent on securing the valuable treasure for themselves. An evil Russian Mob Boss and a love-jilted Chicken have sided with an alien force called the Waquokx who, in turn, are ruled by a devious entity that has escaped from an other-dimensional prison with both a lust for galactic control and a seething desire for revenge. Meanwhile, dark forces are turning galactic citizens into zombies that are being fitted with colorful sneakers, allowing strange outsiders to control their actions through newly created Z-bots. Ghastly beasts are also being recruited from beyond a secret portal to join in the takeover. When the Waquokx attack the capital of Terra 2.0, the Space Junkies are commissioned by the Mayor to discover the agenda behind the invasion and stop the dark forces. The Space Junkies' lust for Cheesecake and strong sense of self-preservations drives them ever further into a mystery that could either save the day... or end it all. In order to bring the Space Junkies to life, S.K. Arunachalam teamed up with skilled penciller/colorist Christian Mirra and inker/colorist Quirino Calderone of SmArt Studio. The result is a captivating tale that has been professionally illustrated and promises to wow its audience. 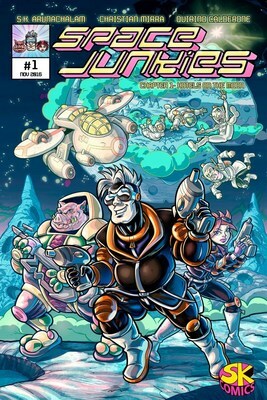 Space Junkies comic book series will offer dozens of issues based on the exciting saga. Three spectacular volumes of Space Junkies tales have been written so far and an outline for a fourth volume is currently underway. Fans will be able to enjoy the ongoing tale as Ggreed, Puig, Margo and the gang chase after the elusive Cheesecake that changes hands more than your favorite dessert. Plans are also in the works to adapt the Space Junkies comic into an animated television show that brings the colorful characters to life and has The Cheesecake Song as its theme. A possible Space Junkies movie may also materialize, giving the next generation of adventure-loving kids as well as adults new sources of silver screen entertainment. However, the most exciting project on the drawing board is the development of a Space Junkies video game. One of the fun concepts of the story is that Ggreed and the gang discover that they are actually living in a complex video game with many of the characters controlled by Gamers. The Space Junkies video game will allow real, enthusiastic Gamers to enter the virtual BotZ World and join the action in the race to grab the Cheesecake, conquer foes and rule the Galaxy. Regardless of whether one's desire is reading comic books, watching T.V. shows and movies, or participating in interactive video games, there is a ton of activities being planned for the growing number of Space Junkies fans!